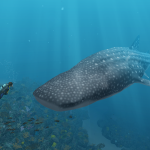 Today’s release of our new Sylvia Earle avatar and Belize dive site caps a busy year! First off, our apologies for the long gap in updates – it’s been a completely crazed few months since our Infinite Scuba update went live in November. It has been great to see excitement for the game build, slowly and steadily, since that time. We *knew* our tribe – those who would enjoy a relaxing, educational plunge into the ocean – was out there somewhere! The response from divers, environmentalists, educators, kids, parents, grandparents, and others searching for a unique, non-violent game experience has been wonderful. It has especially been a privilege to meet so many of you in person at Power of Play, Game Connection, GDC, and the Scuba & H20 Adventure show, as well as the many schools, clubs, and other events where we’ve shown the game recently. Next up is iFest in Seattle on 3 May – we hope to meet more of you there! Infinite Scuba was a finalist in the Game Connection Selected Projects 2014 competition last month in San Francisco. That show was amazing – a diverse international crowd who loved the game. So many follow-ups! Our new dive site (a beauty in Belize selected by our esteemed partner Dr. Sylvia Earle) should be ready for beta in May. Please send mail (via Contact) if you would like to be a beta tester. We are working with a European publisher (formal announcement coming soon) who is releasing the game (in a box!) in Europe this spring. We are the first indie developer to be invited to join the PC Gaming Alliance – we are super excited about the opportunity to work with this visionary group! We have a cool new trailer video on youtube and vimeo. We got a video review that says we’re “gleefully rudderless” – YEAH!! We are exploring a number of other exciting partnerships and projects that came up during Game Connection and GDC. As soon as we can share more news, we will! When we started this project long ago, we decided that the sea turtle, or ‘honu’, would make a fitting totem for our team. The honu represents long life, good luck, humility, and peace. Perfect. The super-cool new version of the game that we debuted at DEMA is now available to the public! If you already have the game, the next time you try to play, you will be directed to www.infinitescuba.com. Please log into the website and go to My Account to download the new version, which kicks off a new era for us. You will be able to post the photos you take on your dives (and the postcards you create) on Facebook and you will be able to purchase new dive gear to customize your diver avatar. Our first featured partner is SCUBAPRO® – check out the new wetsuit, fins, mask, etc. from them in the Gear Chooser. If you purchased the game, you automatically have 500 clams to spend on the new gear. We will introduce new gear from other manufacturers every few weeks, and a new dive site in February 2014! If you run out of clams, you can always buy more on our website. We are off to the annual dive industry-only show (DEMA 2013) in Orlando 6-9 November with a sparkly new build of Infinite Scuba® that includes lots more gear, an early cut of a new dive site selected by Dr. Sylvia Earle, and assorted other improvements and user-requested features. More details when we do an official announcement later this month. Or, if you work in the diving industry, please drop by DEMA’s booth (#1267), where we will be showing off the game all week. We are also debuting our Limited Edition Infinite Scuba Gift Cards, which have beautiful art and scratch-off codes that can be redeemed on our website. They make great stocking stuffers! Originally, we weren’t planning to do any physical distribution, but we have received so many requests from people who want to carry the game, we decided to give it a whirl, but in as eco-friendly a way as possible. Bubble Below dive shop in Woodinville WA is the first shop to carry the cards, in case any of you are in the Seattle area. A demo version of the game is part of the Sea Monsters Revealed: Aquatic Bodies exhibit at the Georgia Aquarium. This aquarium is in Atlanta and gets about 5M visitors/year, so this is fantastic exposure. Two schools are using the game in the classroom this year: a high-school in Marin County CA is using the game in their Marine Biology class, and a K-12 girls’ school in Austin is using the game as part of their DeSTEMber program. We are excited to work with more teachers and schools as we begin our educational outreach. Infinite Scuba™ is now available for purchase for the Windows and Mac platforms! Please go to www.infinitescuba.com for more info and to download the game. Wow, time really does fly when you’re having fun! This weekend, June 1-2, we will be showing the game at the Gear Up Expo in Everett WA WA. We’ll be in booth 202, right inside the arena entrance, with our awesome friends from Bubbles Below. Last month’s launch of Infinite Scuba™ has lead to an exciting new chapter for us! If you have contacted us, THANK YOU!! We’re getting loads of great referrals and opportunities, and we’re struggling to reply to everyone quickly, so we appreciate your patience. We are especially glad to hear that you’re having fun with the game! Please tell your friends. 🙂 If you have any issues with the game, we like to hear about those, too, as we’re creating new equipment, activities, and dive sites for release later this spring and throughout the year. It’s incredibly encouraging to learn that there’s an audience for our off-beat game. Creating a reality-based, educational, non-violent, *fun* game is veering off into fairly uncharted territory, but what an adventure! Now we tackle the new challenge to get more people find out about the game… please help us if you can. Tonight, April 18, we will be showing the game at the Beer For A Cause benefit for Full Life Care. A rare opportunity to safely drink and dive. This weekend, April 20-21, we will be showing the game at the Dive & Travel Expo in Tacoma WA. We’ll be in booth 403, with our friends from Bubbles Below.